The Consulate General of Grenada, Miami will be closed from Monday, 24th December 2018 to 1st January 2019. The Consulate General will reopen to the public on Wednesday, 2nd January 2019 at 10:00 a.m. 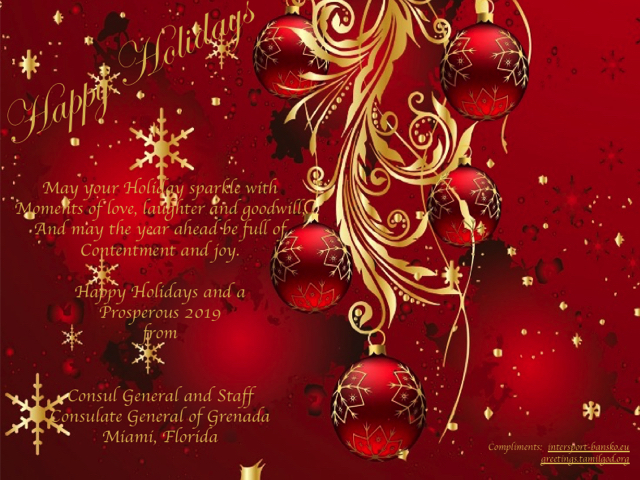 The Consul General and Staff of the Consulate wishes everyone a safe, Blessed and Happy Holiday Season with loved ones and friends and looks forward to serving you again in the New Year. Click here to read the Budget Speech presented by Dr. The Rt. Hon. Keith C. Mitchell, Prime Minister and Minister of Finance and Energy, to the House of Representatives on November 27, 2017, for the budget for 2018. Prime Minister and Minister of Finance and Energy, to the House of Representatives on December 9, 2016, for the budget for 2017. Click here to read the Throne Speech given by Her Excellency Dame Dr. Cecile La Grenade, Governor-General on December 2, 2016. Saturday July 9th (12pm-8pm) is the first annual Grenada Day in Florida! Celebrate the island culture of Grenada, Carricou, and Petite Martinique, with steel band, jab jab,shortknee, vekko, mokko jumbies, clowns, and many more activities. LIVE MUSIC! Come see Tallpree, Skinny Banton, Flying Gaybo, Yankee Boy, Mighty Sparrow, and Wanito! Children under 10 FREE! Advance tickets $20. The event is located at Central Broward Regional Park and Stadium (3700 NW 11 Place, Lauderhill, FL). This publication follows its tabling in Parliament by the Minister of Finance on Wednesday, November 25th, 2015. The general public should note that this version, which includes a watermark (Proposed), does not include any potential amendments that may be made by Parliament. Following Parliamentary approval, the approved budget, including any amendments, will be made available to the Public within two weeks as required by Section 24 (1) (b).